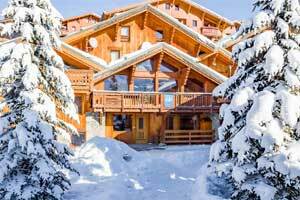 Chalet David Upper shares the same perfect ski-in, ski-out location as all our Les Coches chalets. 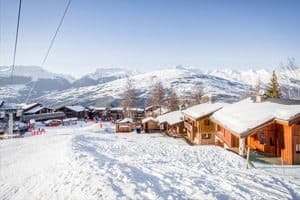 Situated on the edge of a blue piste and with just a quick 30m ski down to a modern 6-man chairlift, the chalet could not be more ski-in/ski-out! This is the upper of two separate apartments sitting one above the other (Upper & Lower David). Taken by itself it is ideal for one large family or two families who know each other. 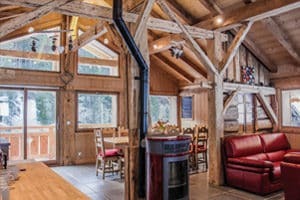 Combined with Lower David it offers excellent accommodation for larger parties of up to 16 who can come together for dinner whilst enjoying separate living space for each of the two groups. Access between the two apartments is via a covered external staircase at the side. Lower David sleeps up to six people while Upper David can sleep up to nine. 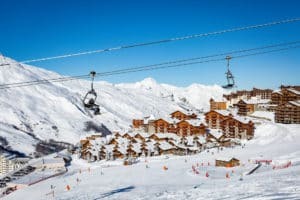 The living areas are open-plan and spacious, with open fireplaces and views across the piste. 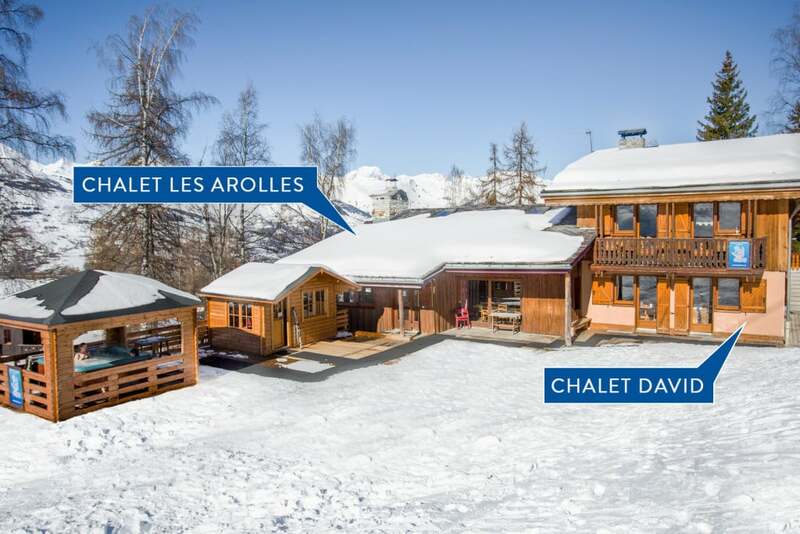 An outdoor hot tub is situated just outside the front door on the decked area and is used by guests from Chalet David and Chalet Les Arolles. 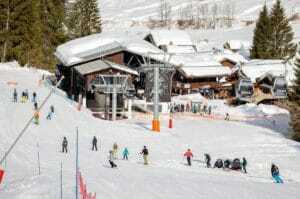 Each apartment has its own cook/host unless the apartments are taken by guests wishing to share evening meals. 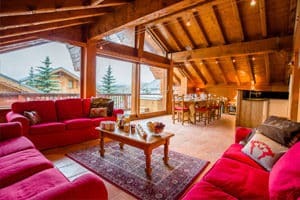 Breakfast in the Chalet David apartments is self-service, with fresh bread delivered daily and bacon and eggs for you to cook. 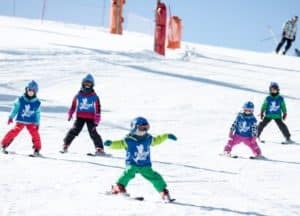 Staff will come and clear up for you once breakfast is finished and you have taken to the slopes. 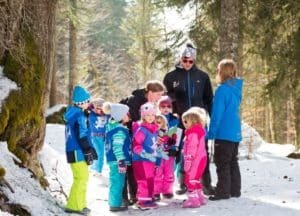 There is a Family food option available in this chalet if you all prefer to eat together as a family at around 6.00 p.m. Our self-contained childcare den is next-door – just a few metres from the chalet. This double room shares one bathroom with basin, one shower room with basin and WC and a separate WC. There are two twin bedrooms. 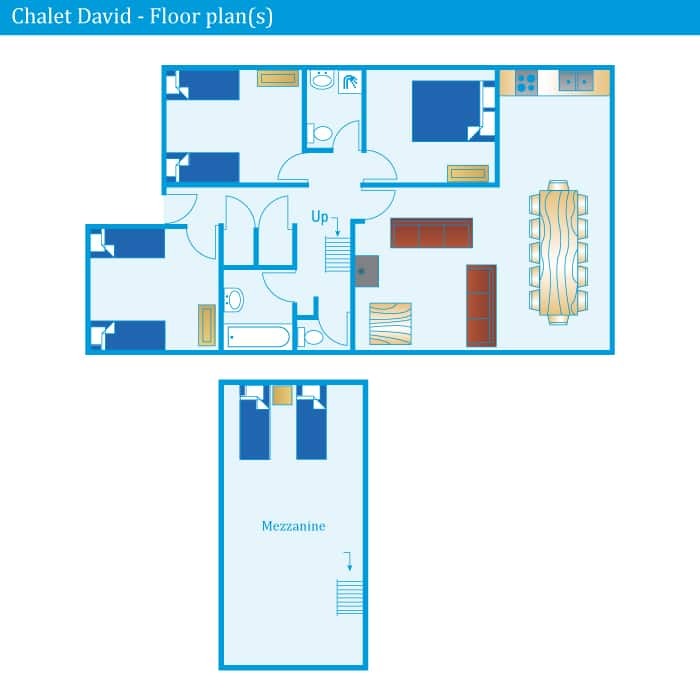 and shared are a bathroom with bath, one shower room with basin and WC and a separate WC. A mezzanine area is great for older children with room for 3 single beds (not suitable for young children as the staircase to the mezzanine is at a steep angle).